We are glad to announce you another Koinup initiative with our partnership: Virtual Worlds Wallpapers! If you like create artistic portraits in The Sims, why not transform them in IPhone/IPad wallpapers? Metaverse Wallpapers is the new brand Koinup iPhone and iPad app that feature amazing wallpapers created within Virtual Worlds and Games. And the purpose of Virtual Worlds Wallpapers group is to seek new contents to dislay in the app. We have extended the endline for our contest, so you are in time to take part on them! take part to "winter portrait" and make your winter themed shot, you can mash up sims2 and sims3, other virtual worlds, you can photomanipulate the picture as your wish..
We wait for your creation! We haven't planning to make an Advent Calendar, you will find some updates during this month, but not a Christmas themed surprise everyday. We're glad to announce the Sims Wallpapers Contest. A new sims contest hosted by Koinup with our collaboration! 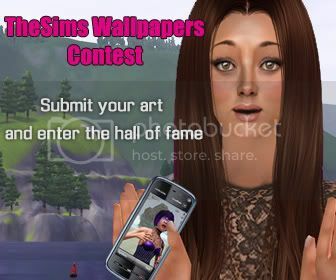 Make your sims-wallpapers to enter the hall of fame of digital art! The Sims Wallpapers Contest is a competition for digital artists that use the Sims (2 & 3), as canvas for creativity. Along with being an incredible tool for machinima "The Sims" (2 & 3) has been lately used by many artists as a tool for digital and fan art creation. Koinup is the 1st place where you can admire some of the most incredible creations made with The Sims 2&3. The most beautiful entries of the contest, picked by a jury made up by Sims2Cri and Liliana Morosini, two authoritative experts in Sims art and culture, will be included in 3D Wallpapers. 3D Wallpapers is the highly popular mobile app built by Koinup for all the Nokia Smartphones that feature the most amazing images of videogames and virtual worlds. You can download the app on your Nokia mobile from the Ovi Store. Let's go to read the contest's rules!